Posture and some of the building blocks are covered on both the Vertical Circles and Sagittal Circles DVDs. The duplication is to allow the student to start with any Level 1 DVD in the series. For a complete chart showing all the moves covered in Level 1 and which DVD they are on, please see the BDfEB ~ Level 1 page. In this DVD, Beginning Belly Dance: Vertical Circles, you will learn proper dance posture essential for safe and beautiful dancing. And with practice, it will carry over to your everyday life, leading to better posture and carriage overall! Graceful arm positions and basic dance movements are the building blocks which combine to create vertical circles. As you learn each step, you will combine it with a previously learned movement creating short combinations so you can see how everything fits together. $20 for the just the DVD or $23 for the DVD, Study Guide and Student Manual. Plus shipping of $4 for US orders and 8.8% sales tax for Kansas Residents. Also includes information on Middle Eastern rhythms, particularly the maqsoum rhythm and a bonus performance by Huraiva. 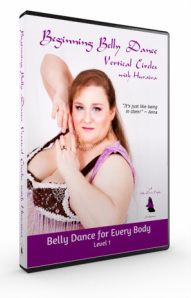 Beginning Belly Dance Vertical Circles Study Guide includes helpful tips for creating the movements more easily plus exercises you can do to help you gain confidence in your movements making them more beautiful so you can execute them with greater ease. Purchased separately, the Study Guide is available for $15. 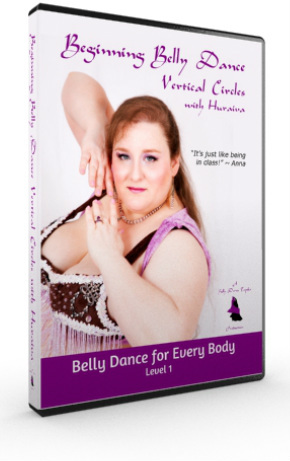 Beginning Belly Dance Horizontal Circles & Vertical Circles Combo Pack.